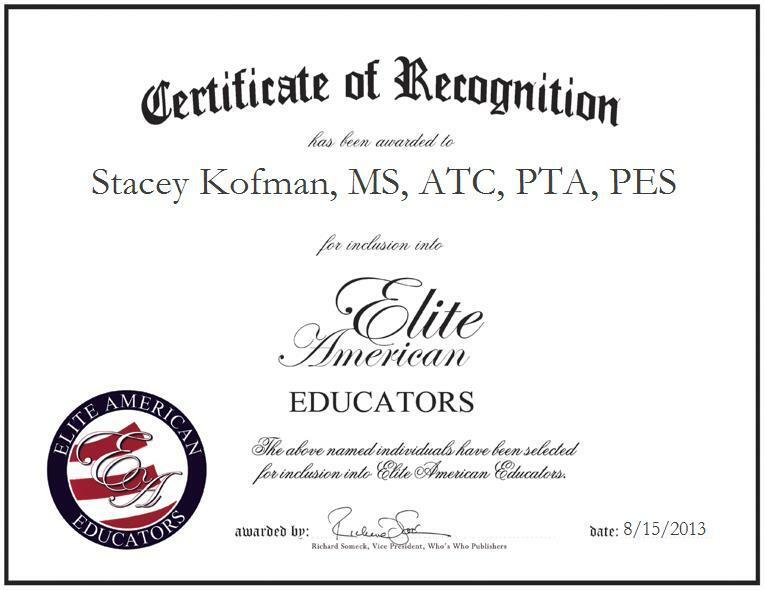 PALO ALTO, CA, August 15, 2013, Stacey R. Kofman, MS, ATC, PTA, PES, Physical Education Teacher and Certified Athletic Trainer with the Athletic, Physical Education, Career and Technology Departments of Palo Alto High School, has been recognized by Elite American Educators for dedication, achievements, and leadership in education and athletic training. In her current capacity, Ms. Kofman is responsible for teaching sports medicine to ninth- through 12th-grade students, and taking care of athletes and treating their injuries. She ensures athletes get all their special needs for practices, and travels with the team for all sporting events. Ms. Kofman worked with the Stanford Women’s Swimming Team from 1992 to 1994, during the Pac-10 Championships and NCAA Championships, as an additional athletic trainer providing medical services and massage therapy for the swimmers. Ms. Kofman also served as a speaker at a swim camp, where she discussed the prevention of shoulder and knee issues. Ms. Kofman has been part of National Championship teams in swimming, as she’s part of the USA Swimming Team. She will work with students who have had problems and injuries in the past. She takes care of the athletes, treats their injuries and sets up for games and takes care of any special needs for practices; she works in all areas of sports and travels with the team. She currently works from Monday through Saturday. Ms. Kofman earned a Master of Science in Exercise Science, Health Care Promotion and Injury Prevention from California University of Pennsylvania, and she also holds a Bachelor of Arts in Physical Education with a concentration in Sports Medicine from the University of the Pacific. She is a member of National Athletics Trainers Association, and the California Athletic Trainers Association.